What is VitaMiss Joint Support? 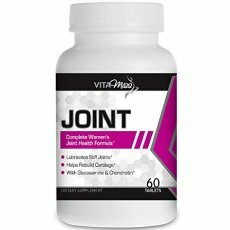 VitaMiss Joint Support is a joint health supplement specifically designed to complement the nutrient requirements and specific needs of women. The manufacturer claims that this supplement can address joint health deterioration with various underlying causes such as aging, repeated use, stress from excess weight and injury. This supplement combines a proprietary blend of 20 naturally derived ingredients all working together to bring much-needed relief from joint aches and pains. Overtime, cumulative results promote significant improvements in terms of flexibility and range of motion. Who is the Manufacturer of VitaMiss Joint Support? This supplement is manufactured by VitaMiss, a US-based company that appears to have produced a handful of nutraceutical products, other than VitaMiss Joint Support. However, there is no information provided about the company on the manufacturer’s official website, making it impossible to establish its history and experience when it comes to formulating products intended to enhance people’s health and wellness. All VitaMiss products are offered free of shipping costs to any point in the US. How Does VitaMiss Joint Support Work? This joint health supplement works by combining glucosamine, chondroitin and MSM with a natural complex composed of vitamins, minerals and natural extracts that help address the multiple reasons for declining joint health. The formula is said to promote an increase in the production of collagen fibers to facilitate the repair and restoration of damaged joints and cartilage, and improve joint lubrication. Other natural components work together to enhance the effects of joint health promotion, improve product absorption, and provide relief from stress and other similar factors that may aggravate or speed up joint damage. VitaMiss Joint Support Ingredients – Are they Safe & Effective? Glucosamine: This ingredient promotes overall joint health by improving the production of cartilage, the building blocks of tissues, which is essential for repairing damaged joints. Chondroitin: It boosts the beneficial effects of glucosamine to improve joint health, and particularly relieves joint aches and pains. MSM: It improves the availability and rate of absorption of calcium necessary to promote the health of joints, bones and muscles to keep joints intact and provide them with cushioning against injuries that may be incurred from impact. Vitamins and Minerals: These nutrients help boost the effects of the three key ingredients above, such as by enhancing the bioavailability of active components in the formula, relieving stress, delivering anti-inflammatory effects, and providing antioxidants to protect joints from further deterioration. What are the Advantages of VitaMiss Joint Support? This joint pain product has been specially designed and formulated to specifically cater to the needs of women. It is formulated with three of the most commonly utilized active ingredients — glucosamine, chondroitin and MSM — although more evidence may be necessary to prove their significant therapeutic effect on painful and stiff joints. It contains vitamins and minerals that may help improve natural body functions involved in repairing damaged joints and in providing enhanced joint protection against causes of future damage. The formula contains amino acids that may help improve mechanisms of the body that are involved in the production of protein which is a top requirement for bone formation and damage repair. What are the Disadvantages of VitaMiss Joint Support? Different users will have unique experiences about this product and, as with other supplements, positive results cannot be guaranteed. Most of the nutrients added to the formula have more anecdotal than scientific basis for claims made about their respective abilities to enhance joint health. How Should You take VitaMiss Joint Support? The manufacturer recommends taking two tablets of this supplement daily for best results. It is always best not to take any more than the dosage recommended by the manufacturer to avoid untoward reactions and side effects. How Much Does VitaMiss Joint Support Cost? Every bottle contains 30 tablets which costs $10. However, this is only good to last for 15 days and, thus, requires spending $20 to obtain a full month’s supply of this supplement. What is VitaMiss Joint Support’s Return Policy? A seller on a major retail site offers a 100% money back guarantee and accepts returns at any time following product purchase. There is no indication that the manufacturer offers a similar return policy. Any guarantees therefore depend on the terms set by individual product distributors. Does VitaMiss Joint Support Offer a Free Trial? There is no information indicating that this product is available for a free trial offer. This joint health supplement basically offers three active ingredients touted by many to deliver therapeutic benefits in the promotion of joint health — glucosamine, chondroitin and MSM. However, there is no strong evidence that suggests supplementing with these ingredients indeed redounds to significant enhancements in joint conditions. Additionally, it is not clear what makes this product specially designed for women – further information should be provided. It is generally difficult to trust a supplement that does not disclose any information about its maker. Since this product is similarly formulated like many other joint health supplements available in the market, it will be a good practice to study options available to you before making a final decision to buy it or not.